I cannot think of many things better to do on a weekend than making some glamorous fascinators over vintage afternoon tea with your best mates! Today’s Wedding Wednesday feature is the UK’s number one Glam Hatter Girl Janie Lawson who owns Glam Hatter Girls. 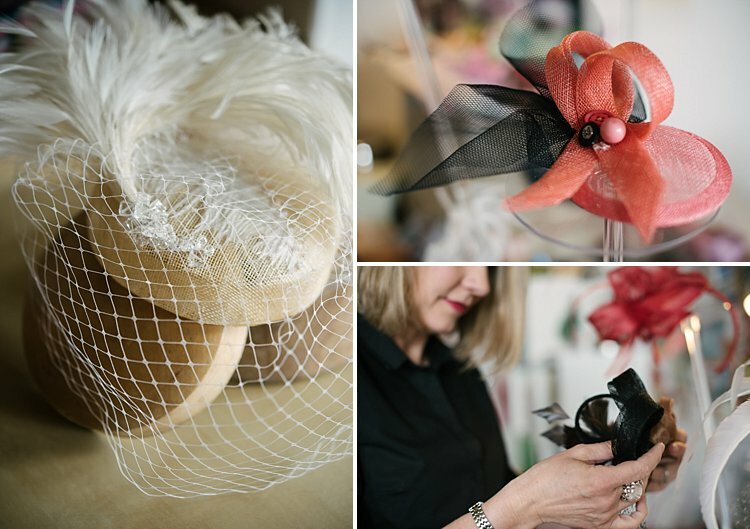 Based in London and Cardiff, Janie and her team run fascinator making workshops all over the UK. The workshops are especially popular with hen parties. 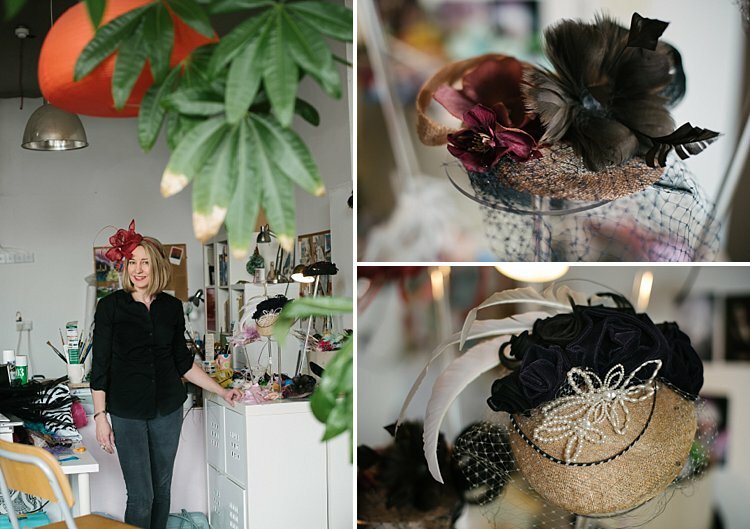 I met up with Janie to take some of her photos in her studio and to ask her a few questions about the rising popularity and success of Glam Hatters. How did you get into millinery and how did Glam Hatters come about? After finishing my studies In Fashion Design with Marketing and Management at Central St Martins, I went on to study millinery at Kensington & Chelsea School of Art followed by Morley college. 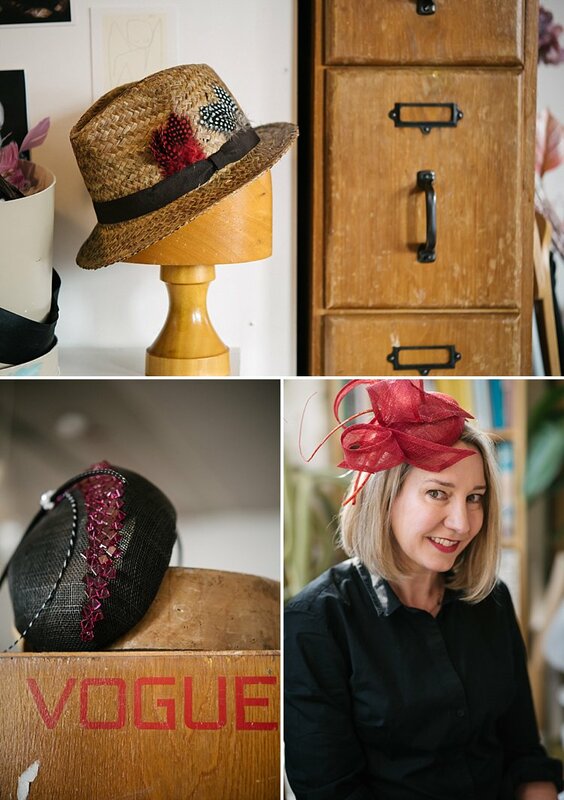 I sold my millinery in stores all over the world and exhibited at London and Paris Fashion week. 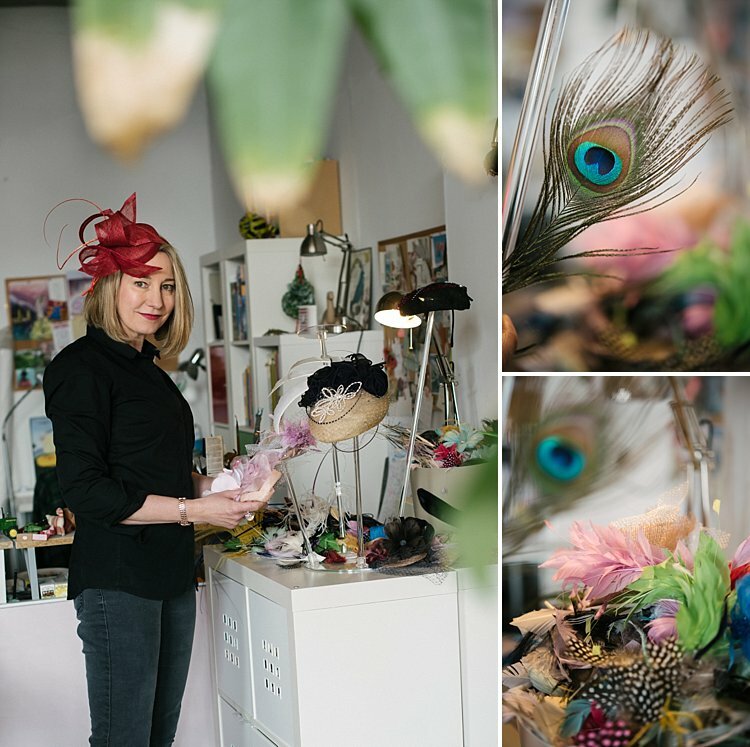 I started running millinery workshops after a lady who had bought one of my headpieces from Liberty called me up and asked if she could sit in my studio and watch me work for the day! I said no that wouldn’t work for me but if you can get a group of your friends together you can come down one Sunday and I’ll teach you to make fascinators. That’s how the workshops started and now I’m so busy booking hen parties and sending my Glam Hatter Girls all over the country as well as hosting at our venues in London and Cardiff that that is now my main business. I love being surrounded by a team and working as part of a team, that suits me much more than sitting in a studio on my own making hats! I love fashion but I’m more interested in art – Frida Kahlo is my all time favourite. Of course it helps that like me, she is always wearing a hat. I also feel an affiliation with her as she too had a disability and used a stick but didn’t let anything stop her and always looked fabulous!!! My style is actually pretty simple, I like tailored clothes, mainly black with some jewel colours thrown in and I usually wear brogues – today I’m wearing my brand new silver sparkly brogues with a black pencil skirt, black shirt and jewellery by my favourite jeweller Stephen Webster. Steve Jobs for creating a “ding in the universe”. Keir Starmer, who is my local Labour MP and the shadow minister for immigration and who is doing sterling work on behalf of refugees in Calais and beyond. Becky Chapple who is one of the main volunteers at Calaid and who is currently out in Greece assessing the situation and seeing what is needed in terms of aid and welfare. Audrey Hepburn for being beautiful and funny and for all her charity work for children. My daughters who constantly challenge my belief system! What was your most memorable glam hatter vintage afternoon tea session and what made it special? My first Glam Hatter Workshop. I’d never spoken in front of 15 people before and I was literally shaking as I was giving the fascinator making demo! They were such a lovely bunch and incredibly encouraging and they all made fabulous fascinators. Within a year of the first party I was at The Country living show giving live demos and wearing a microphone whilst my image was projected on to a screen. I was showing 50 ladies at a time how to make simple fascinators. I went from being incredibly shy in a group situation to shouting out to an audience of 50 and having an absolute ball! Now at The Glam Hatters myself and my teachers are so used to talking to crowds and we love it. We have at least one teacher to every 10 hens so that we can help them with sewing and make sure they have a super-fun time with us. Recently I’ve hosted 3 workshops at The National Gallery. My Dad used to buy me books from the bookstore there and I was so incredibly proud that I was now there with Glam Hatters, surrounded by amazing masterpieces, with a harpist playing and teaching ladies to make fascinators. What would be your top advice to make these events extra special and memorable for brides-to-be and their friends? My advice would be very practical – firstly give the group good directions so that everyone arrives on time and starts the day with a good feeling. Eat a big breakfast (very good for soaking up alcohol!). If you’re drinking have a hard drink followed by a soft drink. And most importantly relax and enjoy your friends. You are all part of a beautiful experience at a very lovely time in someone’s life and you’re all in it together – what could be better than that?! I love and live what I do. It gives me the opportunity to draw out people’s creativity to look after them, create a fun environment and work with gorgeous materials. What would your personal hat / fascinator look like? If you were a bride all over again, what would you wear as a hairpiece / hair accessory on your wedding day? I made my headpiece and I loved it. When I look back there is nothing about it I would change. It was a reflection of my personality and my style. I went for Hollywood Vintage Glamour and I’m hoping because I went for a vintage look that that outfit will always look stylish – but who knows, it will be interesting to hear what my daughters have to say about my wedding outfit when they are in their twenties. Most probably they’ll laugh their heads off!!! We already have venues in London and Cardiff and the Glam Hatter Girls travel nationwide bringing fascinator making hen parties to our customers. I’d now like to increase our venues and to have a Glam Hatters’ venue in key cities across the UK with Glam Hatter Girls local to the area. And to keep on creating fabulous hen parties for my gorgeous customers. I’m also very much about raising money and awareness for people who don’t have the same starting point as I do. I’m very involved with Calaid and will be putting on a Glam Hatters’ Tea Party to raise funds and food donations in May. If you’d like to come and make hats, enjoy afternoon tea and sip cocktails keep an eye on my Glam Hatters Facebook page for all the details. 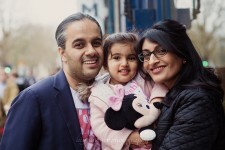 I already have my dream: a family that I adore, a job I love and I live in the most amazing multi cultural city. 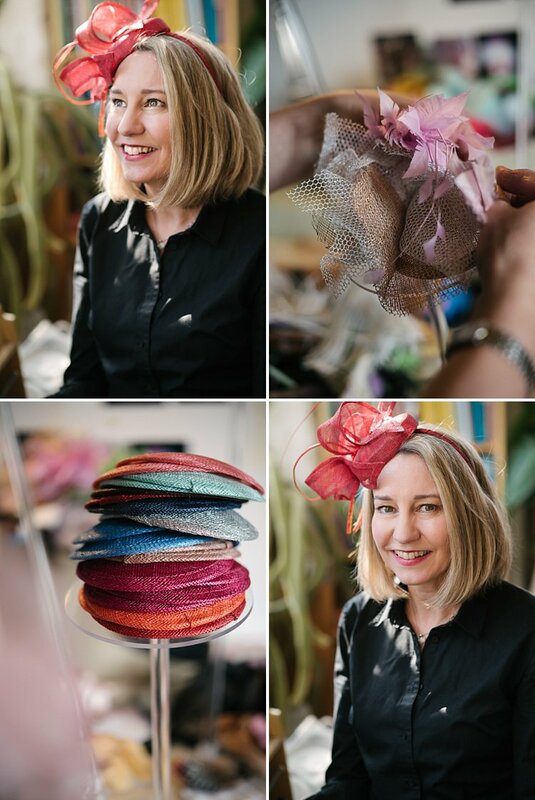 I hope you enjoyed this fascinating insight into the world of Glam Hatters! If you or anyone you know is getting married soon and you want a glam hatter hen do, just give Janie a call. Follow me on instagram lilyrsawyer, twitter @lilysawyerphoto and Facebook for more creative and wedding features coming up!